Mary Jane Hawes Holmes (1825 or 1828-1907), Buffalo Electrotype and Engraving Co., Buffalo, N.Y.
Mary Jane Holmes, née Hawes, was born in Brookfield, Massachusetts to a family with modest circumstances. Her father died when she was 12 years old, and she went to work as a school teacher at 13. She began writing and storytelling at an early age, and published her first story in a local newspaper at 15. In 1849, she married Daniel Holmes and moved with him to Versailles, Kentucky, where they both taught for a few years. The small towns and people she met there served as the inspiration for her novels set in the antebellum South. In 1852, the couple settled in Brockport, near Rochester, New York. She gave up teaching to devote herself to her writing. In 1854, she published her first novel, Tempest and Sunshine, which became her most popular book. She traveled extensively in Europe and the Far East, collecting art and continuing to write and publish about one book a year until her death. Altogether, she wrote 39 novels, plus short stories and novellas. Many of her works appeared first in serial form or were first published in periodicals such as the New York Weekly, Lippincott’s, and the Atlantic Monthly. She sold a total of two million books in her lifetime, making her popularity in her day second only to that of Harriet Beecher Stowe. Mary J. Holmes is currently considered a "single author." If one or more works are by a distinct, homonymous authors, go ahead and split the author. 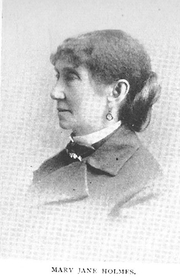 Mary J. Holmes is composed of 5 names. You can examine and separate out names.